Working as a sub-consultant, Meliora designed the new catenary system to support track modifications for the relocated Little Italy – University Circle Rapid Station. Located at Mayfield Road and East 119th Street, the new station is a short walk to the Uptown residential retail development and the new home of the Museum of Contemporary Art. To make room for the new station, the existing track alignment was modified by spreading the tracks to provide room for the new center platforms. 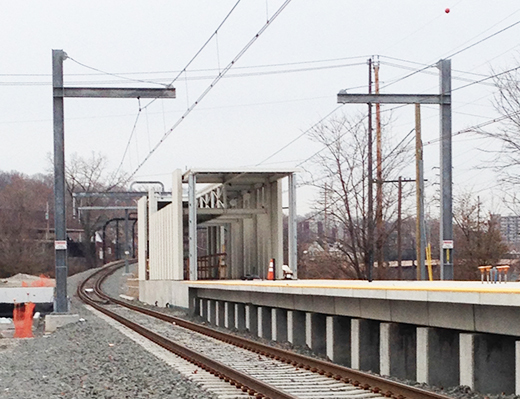 The catenary structures were located to accommodate the new platforms and to allow catenary construction to proceed during a two week outage. Meliora provided design and construction documents for catenary hardware, profiles/hangers, wiring plans, and staging.